What Day Of The Week Is July 30? 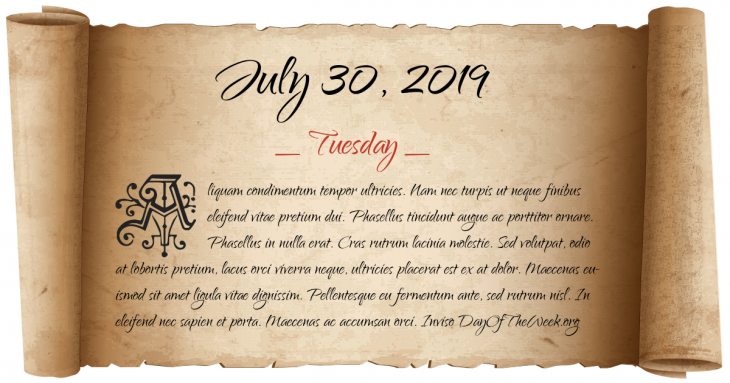 July 30, 2019 is the 211st day of the year 2019 in the Gregorian calendar. There are 154 days remaining until the end of the year. The day of the week is Tuesday. First Defenestration of Prague: a crowd of radical Hussites kill seven members of the Prague city council. In Saint Petersburg, Bartolomeo Rastrelli presents the newly-built Catherine Palace to Empress Elizabeth and her courtiers. New Orleans’s Democratic government orders police to raid an integrated Republican Party meeting, killing 40 people and injuring 150. Israel passes the Jerusalem Law and annexes East Jerusalem. Vietnam War: US President Richard M. Nixon makes an unscheduled visit to South Vietnam and meets with President Nguyễn Văn Thiệu and U.S. military commanders. The Troubles: three members of a popular cabaret band and two gunmen are killed during a botched paramilitary attack in Northern Ireland (see Miami Showband killings). Who were born on July 30?